Serial transfer: In serial transfer, data is transfer to device located many meters away this method is used for long distance data transfer. Parallel transfer: In parallel transfer, data is transferred in 8 or more lines. In this wire conductor is used for transferring data to a device that is only a few feet away. Serial communication is mostly used for transmitting and receiving the signal. The 8051 microcontroller is consisting of Universal Asynchronous Receiver Transmitter (UART) used for serial communication. The signals are transmitted and received by the Rx and Tx pins of microcontroller. The UART take individual bytes of data and sends the individual bits in a sequential manner. The registers are used for collecting and storing the data inside a memory. 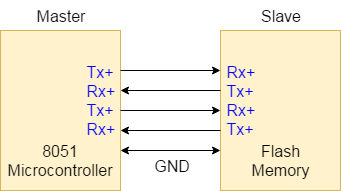 UART is based on half-duplex protocol. Half-duplex means transferring and receiving the data, but not at the same time. This baud rate '3' is stored inside a timer.